A Chin Implant increases projection, provides enhanced facial balance and harmony, and is the most common method of Chin Augmentation. 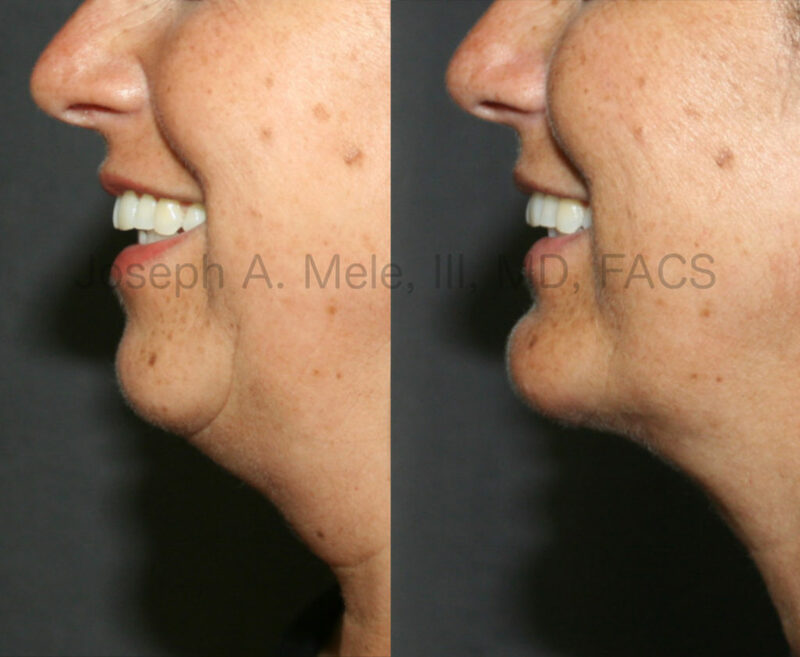 Chin Augmentation balances the lower face when the chin is small or weak. The most common technique for Chin Augmentation utilizes a Chin Implant placed on the front surface of the mandible (the lower jaw bone). The Chin Implant supports the soft tissue of the chin, pushing it forward. The result is improved facial harmony by balancing the upper and lower face and better defining the transition between the face and neck. Chin Augmentation is most commonly used in cases where the front of the chin is located behind the front of the lips when viewed on profile. The following Chin Augmentation Video Presentation shows several examples of Chin Augmentation using Chin Implants. This is the most common procedure used to augment the chin profile, and balance the lower face when the chin is small. This Plastic Surgery Video Presentation is a segment taken from my TV show Body Beautiful, which airs on the San Francisco Bay Area’s News Station, KRON 4. Chin Augmentation with a Chin Implant is an effective, cosmetic surgery, which can dramatically change your facial profile. Computer imaging can facilitate communication between you and your surgeon as many options exist in the types, sizes and shapes of Chin Implants. Additionally, computer imaging can help visualize the aesthetic nature of the results. Like any surgical procedure, there are risks and benefits which should be discussed with your Board Certified Plastic Surgeon prior to surgery. 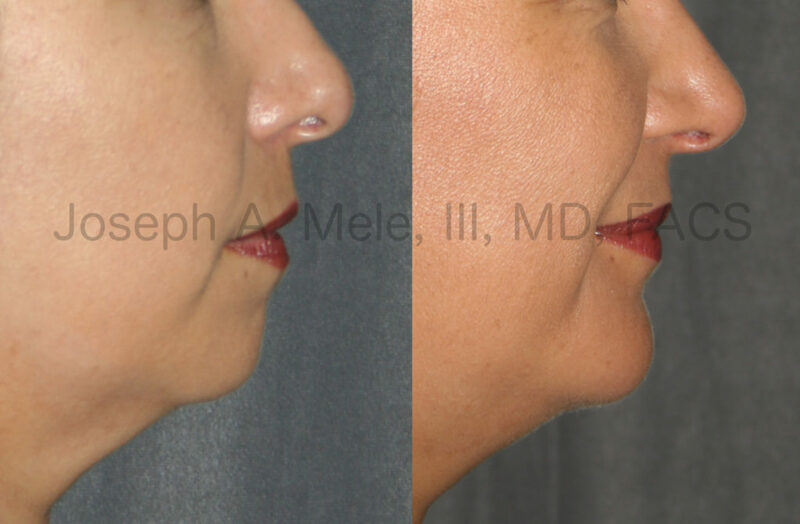 Chin Augmentation before and after pictures: Chin Implants can increase chin projection and definition. Before Chin Augmentation, her chin appears flat, is poorly defined and allows the lip and neck to blend into each other. 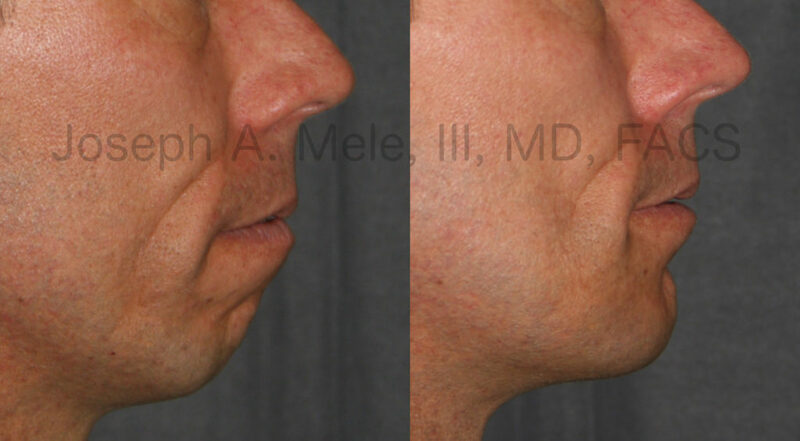 After Chin Augmentation, the Chin Implant provides a defined chin, which clearly separates the lip from the neck. Additionally, the chin’s projection now matches the lips’ and balances the lower face. Chin Augmentation with a Chin Implant is not jaw surgery. It enhances the apparent size of the jaw, but it does not change the mandible or the way the teeth come together. The implant is applied to the front surface of the bone to provide a cosmetic result. Jaw surgery, also known as Orthognathic Surgery, involves cutting the actual jaw bone. Procedures like the Sliding Genioplasty, cut the mandible and slide the chin piece forward. Metal plates and screws are then used to hold the front of the mandible in the desired position. Since just the front of the mandible is advanced, there is no change in how the teeth come together with this surgery. When malocclusion exists, the teeth do not come together properly. The most common treatment for this is orthodontia. While orthodontia can help one’s bite, it moves the teeth in the jaw, rather than move the jaw and the teeth. In severe cases of malocclusion, jaw surgery may be recommended. Operations exist to move the upper and lower jaw. One such operation is the Sagittal Split Osteotomy. This corrects retrusion of the mandible, better known as a severe overbite, by moving the entire lower jaw forward. The main goal is to align the teeth, but it has the added benefit of adding projection to the lower jaw and helping with facial harmony. This is a specialized procedure, only performed for specific indications, by specially trained orthognathic surgeons, usually an oral and maxillofacial surgeon in conjunction with an orthodontist. Chin Implants provide stable Chin Augmentation. In the above Chin Implant before and after pictures the patient is smiling. Even with animation, the enhanced projection is maintained and the definition of the neck line is clearly defined. In cases where there is disproportionate fat of the neck, Chin Augmentation can be combined with Neck Liposuction to further enhance your profile. When dental occlusion is good, or has been corrected with orthodontia, and the concern is primarily the outward appearance of the chin, jaw surgery is usually not needed. This is where Chin Implants have a niche. At your consultation appointment, the best size, shape and type of chin implant is determined. Chin augmentation surgery is performed at an accredited outpatient surgery center. During the procedure, an incision is made either inside the lower lip or under the chin for access. A pocket is made and the implant placed in front of the mandible to provide additional projection. Recovery is variable, depending on the type and size of implant, but is normally a few weeks. If you are considering Chin Augmentation, there is no substitute for consultation with an experienced, Board Certified Plastic Surgeon. In the San Francisco Bay Area call (925) 943-6353 today, and schedule a private appointment tailored to your specific needs. Computer imaging is available.